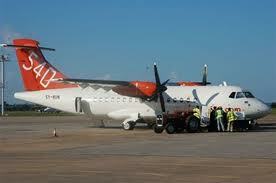 LETS GO TRAVEL KENYA (SAFARIS): Airlines War over the Nairobi Mombasa Route Fares? Airlines War over the Nairobi Mombasa Route Fares? On Monday 17th January 2011, Fly540 the local budget airline announced that it has slashed its fares on the Nairobi-Mombasa route by 30 per cent, setting stage for renewed price wars as airlines seek to defend their market share. The fares reduced to Sh6,540 from Sh9,540 for a return ticket, making it the cheapest airline on the route. Barely two months ago, Kenya Airways reduced its rates by a similar margin having the fare at Sh7,999 while passengers flying JetLink and Air Kenya pay Sh10,500 and Sh11,000 respectively. It is however important to note that the 'low' rates are charged at off-peak seasons and as always bookings must be done in advance considering the prices hike during peak seasons! anticipate the move by Fly540 is set to trigger a renewed pricing war in the airline sector similar to that of mobile telephone firms.